By default, if you try to pull up a page that doesn't exist in a Yahoo! Store, you will be sent to the home page. In addition, when a non-existing page is requested from a Yahoo! Store, the server sends a 302 code back to the browser, and not the standard 404 code (page not found). While this is not necessarily detrimental to SEO, it does send the wrong signal, and landing on the home page without any sort of a message explaining why might be confusing to your visitors. Although this is the default setting, a custom 404 page can be designed and set up in your Yahoo! Store. If you feel up to the task, you can create your own 404 page by following the instructions here. Or, let us design and build a beautiful and functional 404 page. Why would you want to create a custom 404 page? Besides the two reasons mentioned here, you could use your 404 page as an "advertising board". 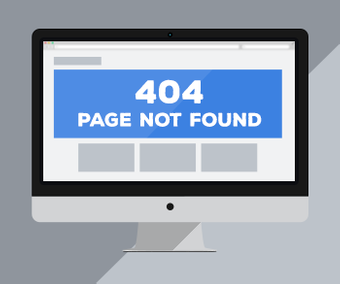 When a 404 page is invoked, it means that a visitor was already engaged by your site because he or she tried to search for something (and couldn't find it.) This is definitely more than a visitor casually browsing your site, so while you have their attention, why not try to point them in the right direction? For example, you could offer search phrases your shoppers commonly search for (you can find these from your Google Analytics account, or even from the Store Manager page under "Searches.") Or display some of your best selling products along with a repeated search box? The possibilities are endless. Take this opportunity to further brand yourself and have fun with the messaging and imagery you incorporate, as in the example below.